Throughout Asia, humans and monkeys live side-by-side in many urban areas. An international research team from the University of Washington, Fred Hutchinson Cancer Research Center and Jahangirnagar University has been examining transmission of a virus from monkeys to humans in Bangladesh, one of the world’s most densely populated countries. The scientists have found that some people in these urban areas are concurrently infected with multiple strains of simian foamy virus, including recombinant strains — those from more than one source — originally detected in the monkeys. Could Simian Foamy Virus be Next HIV-Like Outbreak? Simian foamy viruses, which are ubiquitous in nonhuman primates, are retroviruses that exhibit high levels of mutation and recombination – a potentially explosive combination. In a paper published Sept. 4 in the journal Emerging Microbes & Infections, the scientists characterize the simian retroviral strains that are being transmitted between species and provide a glimpse into the behaviors of humans and monkeys contributing to the infections. By analyzing what is happening at the human-primate interface, the researchers hope to protect humans from another deadly outbreak similar to HIV. They focus on Asia because that continent has witnessed the emergence of several infectious diseases in the past decade. Asia also has a volatile combination of a population that is increasingly mobile and with a compromised immune response living in proximity with animals. A man with a performing monkey. In the study, researchers collected biological samples from a group of nomadic people who travel throughout Bangladesh with their performing monkeys. The research team found that transmission of simian foamy virus between species occurred most commonly through bites. 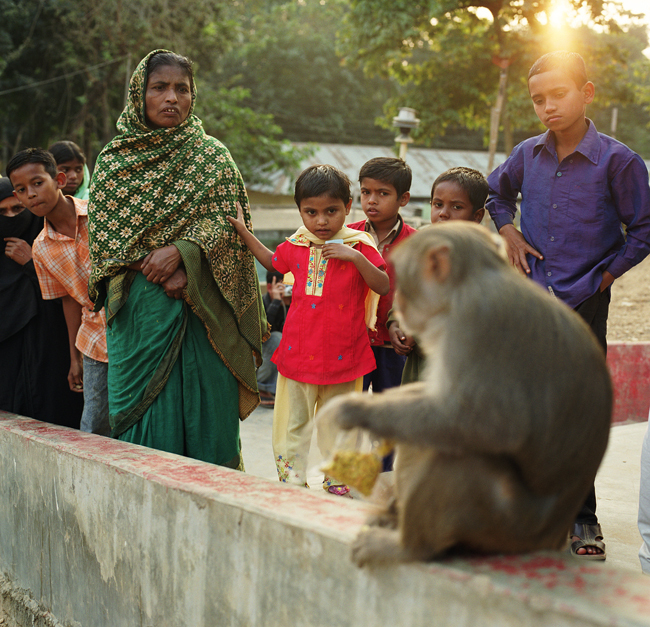 In the study, researchers collected biological samples from hundreds of people and macaques in five urban sites, as well as from a group of nomadic people who travel throughout Bangladesh with their performing monkeys. Read the full article from UW Today.